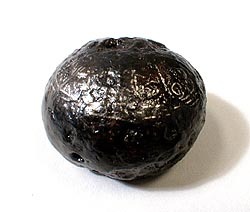 Pommel (early 17th century): High-quality, silver-inlaid pommel —probably from an English saber. This example is from Jordan’s Journey near Hopewell in Prince George County. The silver inlay decoration was revealed during the conservation treatment, as it was completely covered by corrosion when recovered.